In this episode of Confetti Park, Katy Hobgood Ray interviews Kid Chef Eliana de Las Casas, a New Orleans-based chef who is seriously one of the hardest-working kids around. Eliana has been cooking since she was four years old! Her interested hasn’t waned over the years from those early days of watching her family elders make food in the kitchen. Now at 16 years old, Eliana has bloomed as a chef, as an entrepreneur, as a cookbook author and as a culinary personality. Eliana was born in Gretna and has a whole lot of cultural influences driving her style. She describes herself as a gumbo of Filipino, Cajun, Honduran, and Cuban. Eliana’s mom is notable Louisiana children’s author Dianne de las Casas, and she encouraged Eliana to start a food blog when Eliana was touring with her at book signings around Louisiana. From there, Eliana’s abilities as a media mogul, too, grew! Soon Eliana was doing cooking tutorials for kids on YouTube, and before long she declared her intention to publish a cookbook. She was only ten years old when her first cookbook came out—today Eliana has three: Cool Kids Cook: Fresh & Fit, Cool Kids Cook: Louisiana, and Eliana Cooks: Recipes for Creative Kids. In this interview, Katy and Eliana dive deep into Eliana’s early inspirations and her current aspirations, which include launching her own line of spices. They also talk about some of Eliana’s adult mentors, such as New Orleans-based chefs Tory McPhail (Commander’s Palace), Chef Adolfo Garcia (Primitivo, RioMar) and Chef Ryan Hughes (Purloo). Eliana is currently a full-time student at New Orleans Center for Creative Arts. She takes traditional academic classes in the morning, and in the afternoon, she studies in a culinary arts program funded by the Emeril Lagasse Foundation. She is also a radio host! 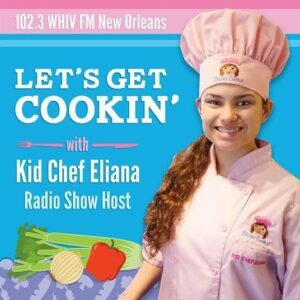 Every Friday at 6pm CT, listen to Kid Chef Eliana’s weekly radio show, Let’s Get Cookin’, on 102.3 FM WHIV. 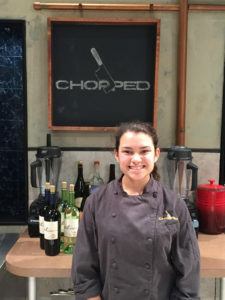 Eliana is competing on Chopped Teen Tournament on Food Network in September. The tournament has 16 teens battling for a cash prize of $25,000. Let’s all support this teen chef representing the city of New Orleans!